You will code, build, and execute two programs requiring decisions. 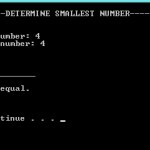 The first program will determine the smaller of two numbers input on the screen. The second program will calculate the number of calories burned on a treadmill using repetition. 8. To be able to use repetition. If you are using the Citrix remote lab, follow the login instructions located in the lab (under General Resources within Course Resources) in Course Home. 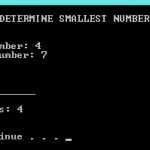 Write a program that inputs two numbers and determines which of the two numbers is the smallest. If the numbers are equal, display a message that they are equal. You will be asked to enter two numbers. The smallest value will be displayed or a message if they are the same. Display description of the program. Prompt the user for the first number. Prompt the user for the second number. Create a new project and name it LAB2A. Write your code using the processing logic in Part A, Step 2. Save your program by clicking File on the menu bar and then clicking Save Program.cpp, or by clicking the Save button on the toolbar, or Ctrl + S.
To compile the program, click Debug and then Build solution (F7). You should receive no error messages. If you see some error messages, check the code above to make sure you didn’t key in something wrong. Once you make your corrections to the code, go ahead and click Build >> Build Solution again. 3. Save the Word Document as Lab02A_LastName_FirstInitial. 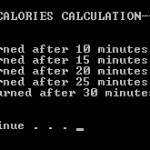 Write a program that uses a loop to display the number of calories burned after running on a treadmill for 10, 15, 20, 25, and 30 minutes. Running on a treadmill burns 3.9 calories per minute. 39.0 calories were burned after 10 minutes. 58.5 calories were burned after 15 minutes. 78.0 calories were burned after 20 minutes. 97.5 calories were burned after 25 minutes. 117.0 calories were burned after 30 minutes. Create a new project and name it LAB2B. Make sure you close your previous program by clicking File >> Close Solution. Write your code using the Processing Logic in Part B Step 2. 3. Save the Word Document as Lab02B_LastName_FirstInitial.